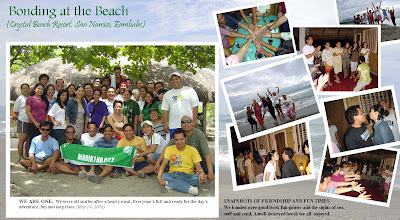 I was in San Narciso, Zambales last Wednesday and Thursday with my officemates. It was our time to unwind, enjoy and make new friends. We left Marikina at exactly 5:00 AM on Wednesday and we arrived in Crystal Beach Resort at 8:30 AM. We passed the newly constructed Subic-Clark Expressway and traffic was so light. It was a very enjoyable and pleasurable bus ride. I immediately checked out the room assigned to us, the girls were supposed to be in the air conditioned rooms while the boys will be in the well-ventilated rooms hehe, as in electric fans(they agreed to that anyway). But in the end, I agreed to stay in the non-airconditioned room with my other lady officemate because the air-conditioned rooms were so small. We stayed on one of the boys' rooms. I immediately left my bags, got my cell phone and shades and went to the beach with a friend. I have to check out the sea and take pictures. It was our first time in that resort and nobody knows what it really looks like. We've seen some pictures from their website but it's quite different when you look at it by yourself. As we found out, the sea was not actually good for swimming because the waves are so big, it is actually a surfing beach. But my spirit was not dampened, I did not intend to swim anyway and besides the waves are really spectacular. What we did was to try to beat the waves but we did not win. One wave after the other came and brought us tumbling and laughing at the same time. I stayed in the water for only a few minutes but I really loved the experience. We had a sumptuous lunch and we played "quiddler" (a short-word game) afterwards. Time really passes by so fast and we didn't notice that it was already time for dinner. It seems like what we did there was to just eat and play and have a good time and I told myself... THIS IS LIFE! We left the beach with smiles on our a little bit sun-burnt faces but with high spiritS. It's a good thing you missed the typhoon. They say Zambales suffered a direct hit from Cosme. Yeah, we were really blessed with a good weather. I think the typhoon hit on the night that we left zambales. i believe it was 2006 aug, when a typhoon hit san narciso, the flood was freakin high..so yeah, and we were shoveling of all those water out ffrom our house so it would stay like dat.. that was realli fun esp, all members of the family help each othe. it was scary during night though, we could here those construction worker workin at the bridge. but yeah! what an experience@!! !